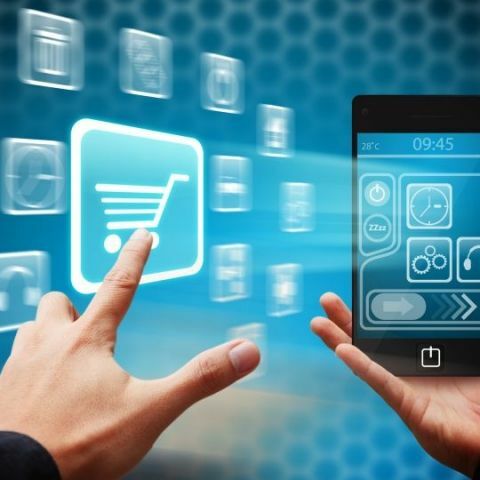 Mobile commerce in India: Ready to hit mainstream? Mobile Internet is apparently taking over the traditional Internet. But have we fully tapped the benefits of mobile Internet? Why mobile commerce hasn't gone mainstream yet? What is its current state and what possible challenges it faces? We take a detailed look. Even as Internet and smartphone penetration increases in the country, e-commerce segment has continued to see a positive growth. While we've already discussed in depth about e-commerce taking a centre stage, we haven't much explored on the state of m-commerce in India. Not much to our surprise, m-commerce is seeing a massive growth, and is set to stand toe-to-toe with the traditional e-tailing. There's no rocket science behind the estimation – growth of smartphones and more secure and easy payment systems on the go are going to boost the segment. It's worth pointing out here that e-commerce giants such as Flipkart and Snapdeal have reported increasing number of transactions from mobile devices. According to an April 2014 report, Snapdeal revealed its mobile apps contributed about 45% of sales on the mobile platform in the previous three months. The report further revealed Flipkart got about 20% of its orders through mobile apps and hopes mobile users to contribute half its total sales in a year. Another company that is going big on the m-commerce segment is Paytm, which has been focussing on mobile and DTH recharges. Here's a few figures Paytm has shared – It receives over 800,000 orders a day, has 90% repeat users, 12 million apps uses and 80% of new users are from mobile. Paytm hopes to hit 1 million orders a day on the platform by end of 2015. Despite in nascent stages, we've already seen a lot of change in the e-commerce industry. Marketplace seems to have emerged as a sustainable model, especially after Flipkart switched its business model. For m-commerce, the model has to be replicated, and made a lot easier for merchants to join the mobile platform. 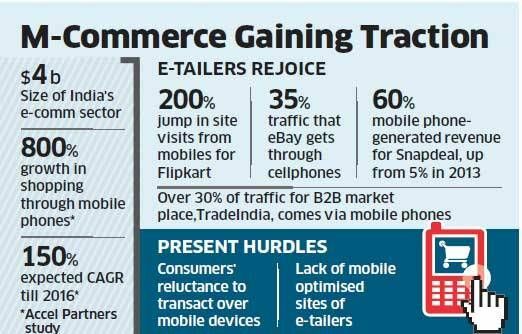 It will be unfair to burden the e-tailing sites for the growth of mobile commerce. Other sectors such as banking and e-governance have to optimise their services for the mobile phone platform. Banking sector in particular has to take the lead in order to push the mobile platform. Wallet system has been around for quite some time, but hasn't gone mainstream in the country. Wallet ensures a convenient and technologically quick method for you to purchase products. If figures from Paytm are to be believed, wallet definitely promises high potential – it has over 15 million active wallets within 10 months of launch, out of which 6.5 million with money or saved cards. One of the most important reasons why m-commerce isn't getting the push it could have achieved is lack of trust on non paper payments. With more secure payment procedure makes it way, we expect the trend to change, ultimately help boost the mobile commerce. Concluding, we believe there’s a lot more need to be done to increase our focus on the mobile platform, overcome the challenges and most importantly make it more convenient. What do you think about the state of mobile commerce? Do you have any ideas how the segment can grow further? Let us know your views in the comments section below.